This beautiful home located in New Buffalo is situated on a quiet, serene street and features many great amenities. This home has been fully renovated with everything from new carpet, hard wood floors, granite counter tops, all new furniture and a great family room with fireplace, bar and access to large deck with a hot tub plus a fire pit. 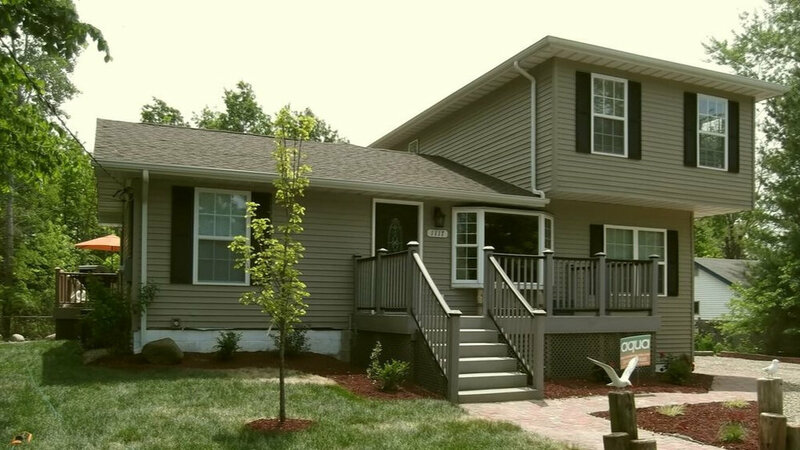 This home features three bedrooms and 2 full baths. On the main floor there are two bedrooms, one with a queen bed and the other with a queen size sleeper sofa. The master bedroom is located on the second floor and has a queen bed, full bath with jacuzzi tub and access to an outdoor balcony. When you enter the home you walk into a living room/dining room area. The living room has a pull out couch and a large bay window. The kitchen has all new appliances and granite counter tops. Off the dining/living room is a family room with a large flat screen tv over a beautiful gas fire place. The family room also includes a full bar and access to a large outdoor deck with plenty of outdoor furniture, a gas grill and an eight person hot tub. There is wifi, Direct TV and a sound system throughout the house. This home is about 1 mile to the beach and just blocks from Oselka Park, kayaking and another park with a splash pad (New Buffalo Township Park). The nearest beach is New Buffalo Public Beach and has parking available. Come and enjoy all that this home has to offer all year round! . This place is so great! You will LOVE IT! The hot tub made us relax so much, the house had so much space to spread out, the kitchen had everything we needed, and more! I cannot wait to go back and stay here again! It is close to everything! Thanks for a great vacation!!! Visited the New Buffalo area early fall and had the opportunity to stay at this property. The house was very well prepared and had everything you would want. The property is very nicely decorated and comfortable. Loved the hot tub for the chilly evening. Beautiful master bedroom with private bath. Cute little balcony off master bed room. My husband and I felt like it was a second honeymoon. Would go back in a heart beat. My family and I traveled to New Buffalo for a week in the summer and stayed at this beautiful rental home. We loved it from the minute we walked in! Very spacious, clean, and I loved all the bedrooms! Perfect for my family size and kids as well. We spent the week sightseeing the downtown area, hanging at the beach, but mainly staying at the rental. There was plenty of outdoor space, and the fire pit and deck were a great hangout spot. The hot tub is huge, and all right next to everything in the backyard so we all were pleased. I can't wait to bring my family back again for another summer vacation. I will be sure to book early as I know this rental will book up fast! Thanks again for the wonderful vacation!! House is very clean and comfortable. Close to town, the beach, antiques, and flea markets. Tons of sleeping room and fully stocked kitchen for cooking (pots, pans, etc.) Will definitely be back!!! A few friends and I planned a relaxing weekend to New Buffalo and really enjoyed our stay at this house. Even though the weather wasn't great we still had a nice time at the house. The family room was a perfect spot to hangout while watching TV and enjoying the fire place. The hot tub was a great addition since it was a chilly weekend. It wasn't far from downtown or the beach and a walk away from Redamaks (a great burger restaurant). Would definitely go back when the weather is warmer and take advantage of all the outside space and beautiful scenery. We had a wonderful time at the Great Escape. We had a few different members of our family come up for a week and there was plenty of room and plenty to do. We really enjoyed the house, it was clean, spacious and had great outdoor space. The house was fully stocked, didn't need to run out for anything! We had trips to the beach, The Stray Dog, wineries and peach picking. It is a lovely time for families of all sizes and ages and we would love to rent the house again! I had such a wonderful trip to New Buffalo, I can't wait to come back again to this rental. Three couples joined my husband and I, and we did a winery trip. The house is in the perfect location, close to the restaurants and shops, as well as being secluded to make the perfect getaway. The winery booking picked us up from the house, and dropped us off as well, such a convenient factor. The booking of this rental was very easy, and everyone to work with was so pleasant. The home was full of life, spacious, and very clean and put together. We loved the deck for grilling, and the hot tub and fire pit at night. We can't wait to come back again, thanks for the wonderful hospitality. Really enjoyed our stay. Beautiful home for a nice family get away. We had a family wedding over the Holiday weekend, so our children & grandchildren stayed here. Home had everything we needed & wanted. It cooled down so we were able to enjoy the hot tub & smores at the fire pit. Spacious living/sleeping quarters. Lots of things to do in the area. Games, movies, bicycles, beach chairs & toys were available. Only suggestion would be new mattresses. Other than that we really enjoyed our stay & would consider this rental again. My family and I were looking to get away from the busy city of Chicago, and we didn't want to travel far. We were recommended to visit New Buffalo, Michigan. We easily found this rental online, and the booking process went smoothly. My family and I enjoyed a great week, and the property was a clean home away from home. We were very close to the restaurants downtown, but this home provided a great outdoor living area, and we really enjoyed the fire pit and hot tub. We will certainly be visiting again. We recently took a trip to New Buffalo and stayed here. The house was perfect! So spacious, clean, family friendly and a great home away from home. I loved the deck outside and hot tub and fire pit as ell. Close to downtown area and all the shops and restaurants. I highly recommend staying in this rental, as I look forward to my next summer getaway to New Buffalo!! My family and I enjoyed a great week, and the property was a clean home away from home.